Gretchen McNeil, author of GET EVEN, wears her 80's influences on her sleeve. 1 Gretchen McNeil, author of GET EVEN, wears her 80's influences on her sleeve. What is your favorite thing about GET EVEN? I started off with a revenge plot, kind of like The Count of Monte Cristo set in high school. But I realized early on that I preferred an A-Team style group of revengers working unselfishly to avenge others. But I wanted it to have a light tone, in the same way that John Hughes used difficult issues like class struggle and bullying, but in a humorous way. That's when the pitch solidified in my head: The Breakfast Club with a body count. And I went from there! I wrote the first draft in about three months, then spent a long time in revisions with my editor. This book is significantly more complicated than my previous books, and we worked long and hard to get it right! I just finished the sequel GET DIRTY which will be out in June 2015. My first series! 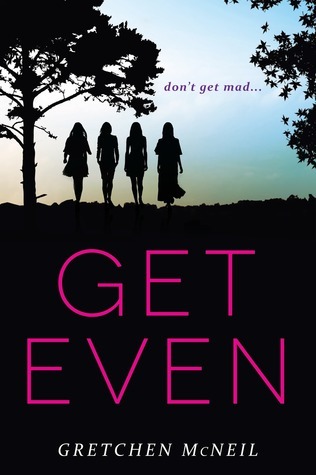 Enter here to win a signed hardcover copy of GET EVEN! Giveaway ends 9/21/2014 at midnight EST.